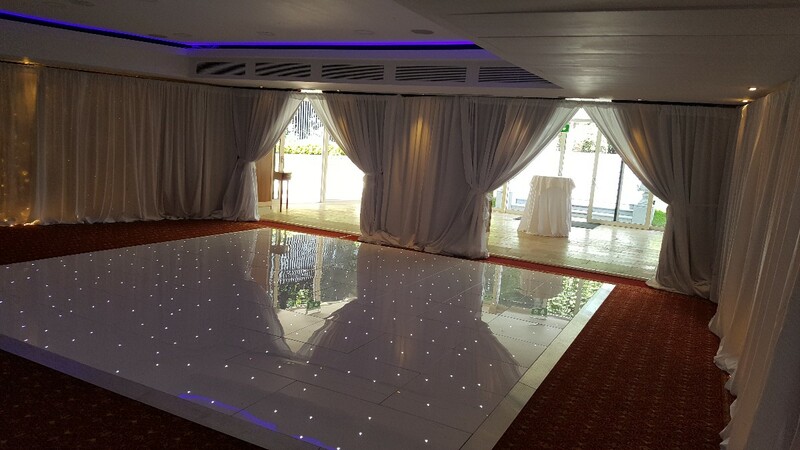 Let us add a little extra sparkle to your special day with one of our stunning brand new sparkling dance floor. Our new dance floors have been purchased in 2017, this make them some of the newest twinkling dance floors in the country. Most importantly they are UK manufactured by the maker of the world’s leading dance floors, they are a company call Grumpy Joe’s, not only are they stunning looking but this also makes them as reliable as any LED dance floor can be. 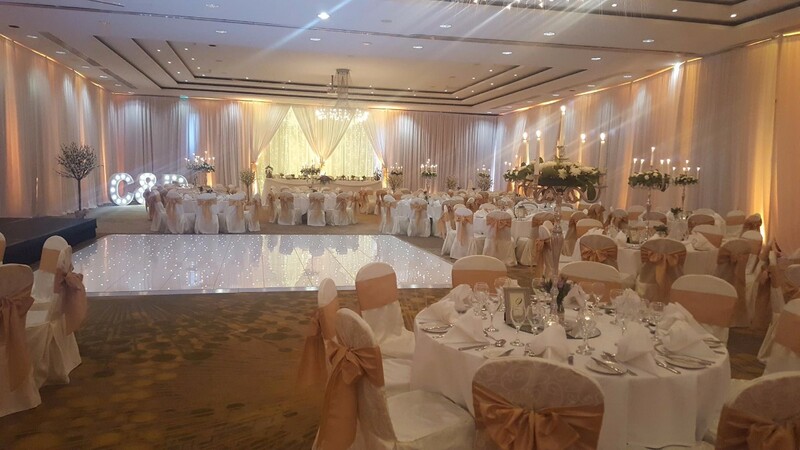 Lighting becomes more important as your evening goes on into night and our LED sparkling dance floors will help transform your room into a very special intimate setting that you and your family and friends can enjoy and remember long after your big day. 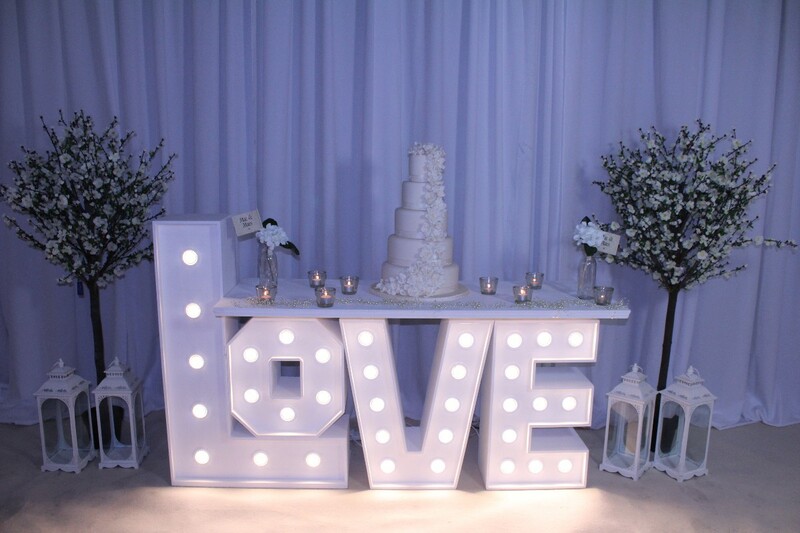 To compliment our fairy light dance floor we also provide giant light up letters, custom built fairylight bakdrops and now our LED Love table. 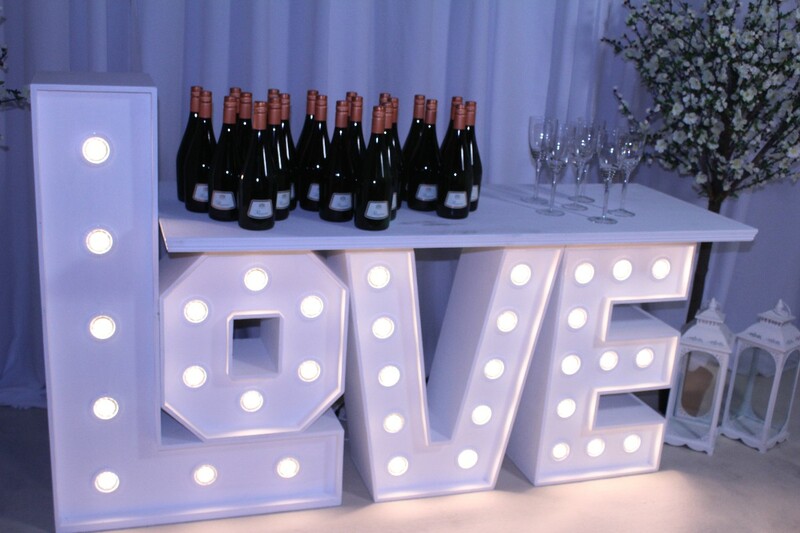 This led letter table will light up to match our giant letters and was designed by us as a cake table but recently has been used as a candy table and a prosecco table. 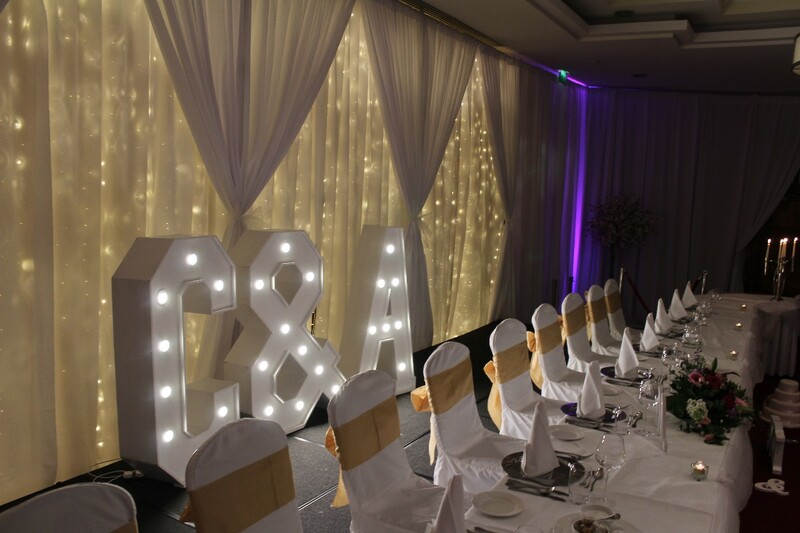 We believed that there was very little been done with the cake tables and the cutting of the cake is a major part of your wedding so we designed and manufactured this table to change all of that and it is a fantastic tie in with our range of giant letters. Our Giant Light Up Letters are 4 foot 6 inches tall and 10 inched deep, this makes them some of the largest letters available in the country. We have all combinations available and have provided the following to weddings all over Ireland, the couple initials, MR & MRS, I DO, # I DO, HITCHED, JUST MARRIED, LOVE and many other combinations involving surnames with MR & MRS or even 2 full first names. 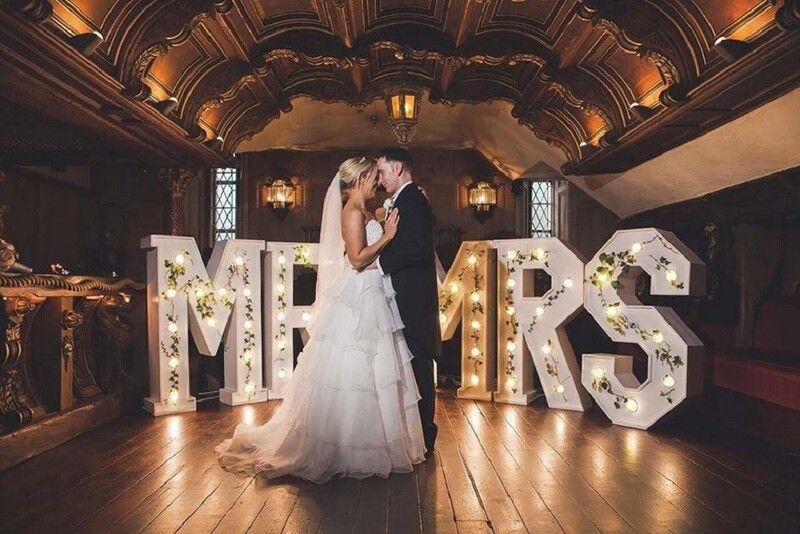 Our stunning custom built fairy light backdrops with also bring beautiful light to behind your top table and we can also provide panels of fairylighs around your walls to help make your room even more spectacular and totally different to most wedding. Contact us today and we can help make your wedding stand out from the crowd. wow weddings provided our draping, starlight dance floor and photo booth and they were brilliant!! 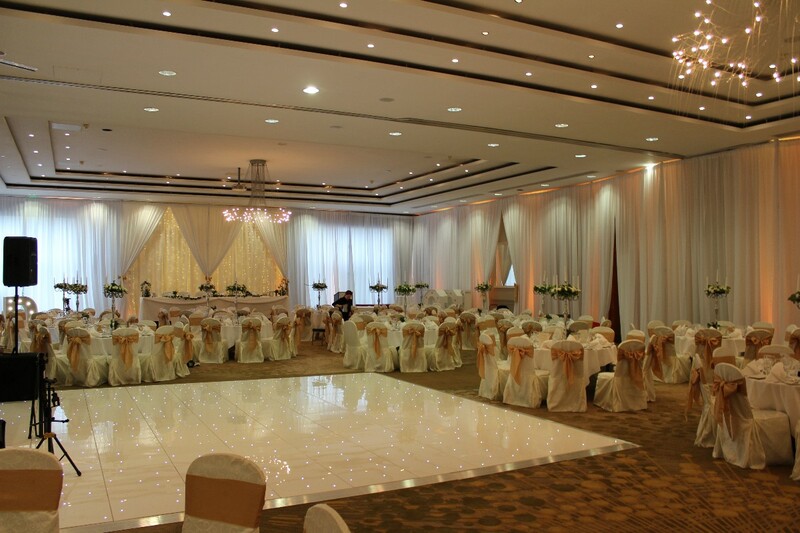 When we walked in to our reception room our breaths were taken away. The room was stunning! Everyone also loved the photo booth and it was great to get the album of prints that night, there was some laugh the next morning looking back at the pictures from the night before! We used Wow Weddings as our Event Decor Stylist for our weddingsonline Awards this year and what a WOW factor they created for us! Everyone of the team are professional, friendly and helpful at every step of our planning journey, right up to the event at the CityNorth Hotel. They took care of every detail and made helpful suggestions on how to get everything looking its best. 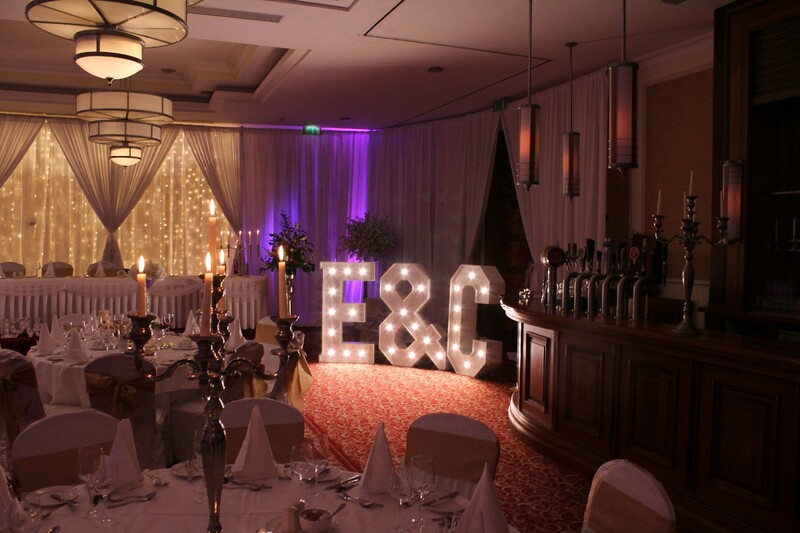 We also used their Light Up Letters and Selfie Mirror, they were a great addition to the event. I will definitely be recommending them to others in the future! Wow is a word to describe something out of this world and breath taking, dealing with Ollie from start to finish firstly was a dream , but when them doors opened and I seen the room we were having our reception in I was completely taken back. Wow, it was like a dream , it was the most beautiful place in the world and it was my wedding. I can’t thank Ollie and his team enough and I’d highly recommend Wow-Weddings. Wow weddings were absolutely fantastic, very accommodating and unlike most wedding suppliers excellent value for money. 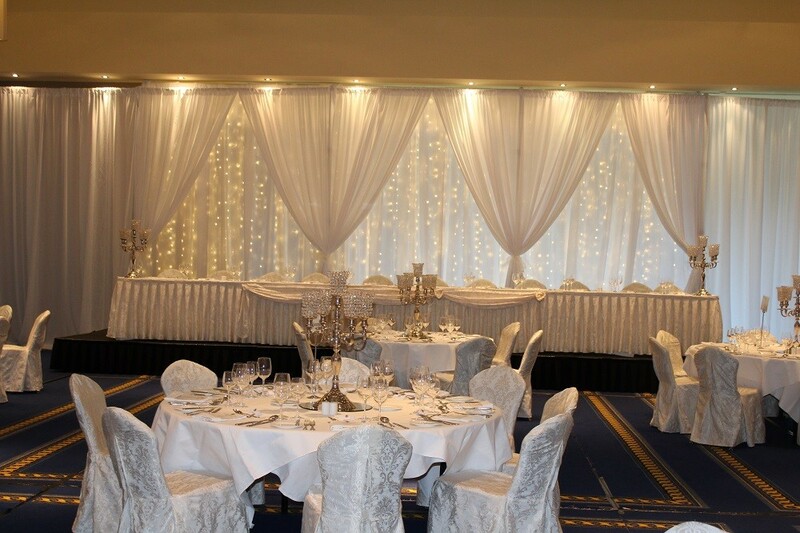 We had our wedding in Kilronan Castle and the room was draped by wow weddings with uplighters, it was like a fairytale. Most impressive were the flowers, the bouquets and church flowers were really beautiful and just perfect. We dealt with Tracey who was so professional and an absolute pleasure to deal with. I would 100% recommend this supplier to all wedding couples as you will not be disappointed. Was at a Wedding last week that Wow Weddings catered for and I have to say they definitely put the WOW factor into the Decor. The room was like walking into a fairytale with beautiful fairy light backdrops on the walls and the covered seats and table settings they put loads of little details into it. The Bride and Groom were over the moon with everything that Paula Ollie and Tracy had done.I would highly recommended them to cater for your wedding. I used wow weddings for my wedding at kilronan castle in December 2016. The ask was to drape drape 3 walls and use pink uplighters. I only needed 3 as the hotel supplied a fairy light backdrop for the back wall! What they did on the day was beyond what I was expecting. The room looked amazing! They were so easy to deal with not to mention the best value for money around! I had gotten 3 quotes off competitors and Wow weddings were the best quote! I have already recommended them to my friends and they have since booked wow weddings for their weddings! We can't recommend Wow Weddings enough! From the first time we contacted them, Ollie and Paula were so helpful and organised exactly what we wanted. All of our wedding photos look even better with the beautiful Chivari chairs they provided and they were incredibly professional with delivery and collections too. Thank you so much for the extremely amazing job you did at our wedding. I loved it and all the guests commented on how well the room looked. We would like to highly recommend this company , guy who was looking after booth was very professional . Our guests had a blast. thank you. Got a photo booth from them as my other photo booth crowd cancelled 6 months before the wedding so these were the only crowd available, for a reason!!! The lady and man on the phone were very accomodating and nothing seemed any trouble in fairness like times location etc but I had a different experience on the night! Apparently the one I had originally had booked (the nice shiny Black one to fit in with my theme on the day had been wrecked by another wedding the night before!) which left me with only 3 choices all of which i didn't like but had no choice. They arrived late and set up in a back corner and when I asked them to move to the place I had allocated they said the hotel staff wouldn't let them. I questioned this the next day with the hotel and surprisingly the small county hotel that bent over backwards for us were never approached by the attendent! The most unpleasent of staff. !! He Absolutely hated his job and that was very clear!! Shabby, torn and very very old props!! Go elsewhere!!!! There was a reason they were cheap and available at short notice!!!! Wow, certainly goes a long way with this company! I have had an initial meeting with Paula, She came to meet me and brought with her some amazing photos of weddings she has done, i have to say i was very surprised, pleasantly surprised. She was friendly, helpful and able to negotiate on prices too! From the flowers to the fairy light back drop, i have to say i feel satisfied that my wishes and wants are going to be fulfilled. Thanks Paula and Wow weddings.Cant wait til the wedding. Review by Claire and David. We met Paula 12 months before our wedding to discuss wedding flowers. At this stage I had no idea what I was looking for so I went along with Paula,s recommendation of Rose and Calla Lilies. She was so easy to get along with and not one bit pushy. Her albums of previous weddings are absolutely stunning and I also decided to hire my wedding chair covers and fairylight backdrop from her. This turned out to be a great decision as her products are very high quality and visually stunning. On my wedding day I was delighted with my flowers and my reception room was beautiful. I am so glad I used Paula and Wow-Weddings for my wedding. Paula definitely helped to put the wow factor into my wedding. Hi Paula, Many thanks for all your help on our wedding day. Our wedding flowers were sensational. Many of our guests complimented our beautiful pew ends that totally transformed our church as you said they would. 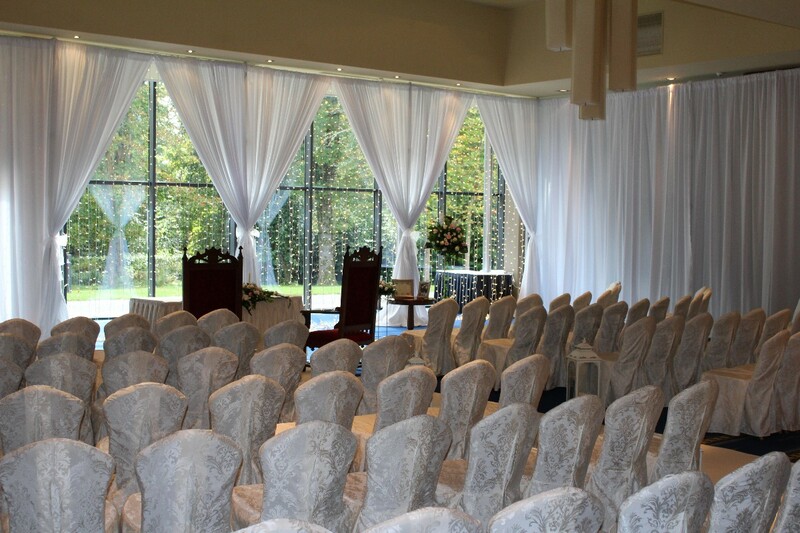 When we arrived at our hotel I was totally blown away by your wedding chair covers and elegant bows. What a difference they made to our reception room. You were so lovely and professional to deal with and nothing was too much trouble. My sister is getting married next year and she definitely will be using your services as you have impressed our family so much. Many thanks once again, . Review by Sarah and Michael. Review by Ciara and John.